Looking for best gas string trimmer for weed eating? We’re here to help. After looking at all of the available models for this year, we’ve come up with these models that are our favorites. Both curved and straight shaft trimmer models are represented, and we are pleased to provide product recommendations for every homeowner’s needs and budget. Our top choice for 2013 is the Echo SRM-225 string trimmer. 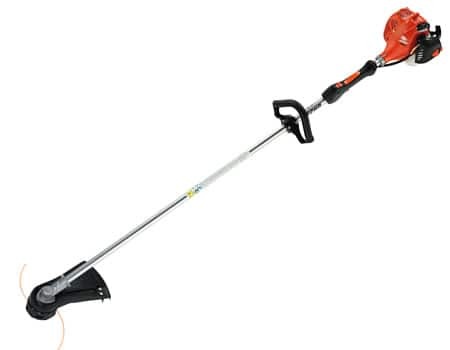 According to the manufacturer’s website, this is the most fuel-efficient straight-shaft string trimmer. Even more impressive are the 265 reviews on homedepot.com that award this trimmer a 4.5/5 star average. The SRM-225 includes a Power Boost Vortex 2-stroke engine that provides a deceptively powerful cut for a 21.2cc engine. The SRM-225 also offers an i-30 starting system that claims to reduce starting effort by 30%. Users agree that the simplicity of starting the SRM-225 is exceptional. Another standout feature is ease of head replacement—some users can do it in under a minute. The .095 Cross-Fire line can handle both thick and tall grass in one pass and, amazingly, there have been virtually no issues with the line feed working improperly. Besides providing nearly flawless performance, the SRM-225 features an anti-vibration design, translucent fuel tank, built-in arm rest, and ergonomic left and right cushioned handles. The aluminum shaft is 59” long with a flex cable drive. Weighing 12 lbs, the trimmer is adequately balanced for one-handed edging and trimming hard-to-reach areas. If you are looking for longevity in a reliable trimmer, this model comes with a 5-year residential warranty. For $200, we think this unit is a bargain. 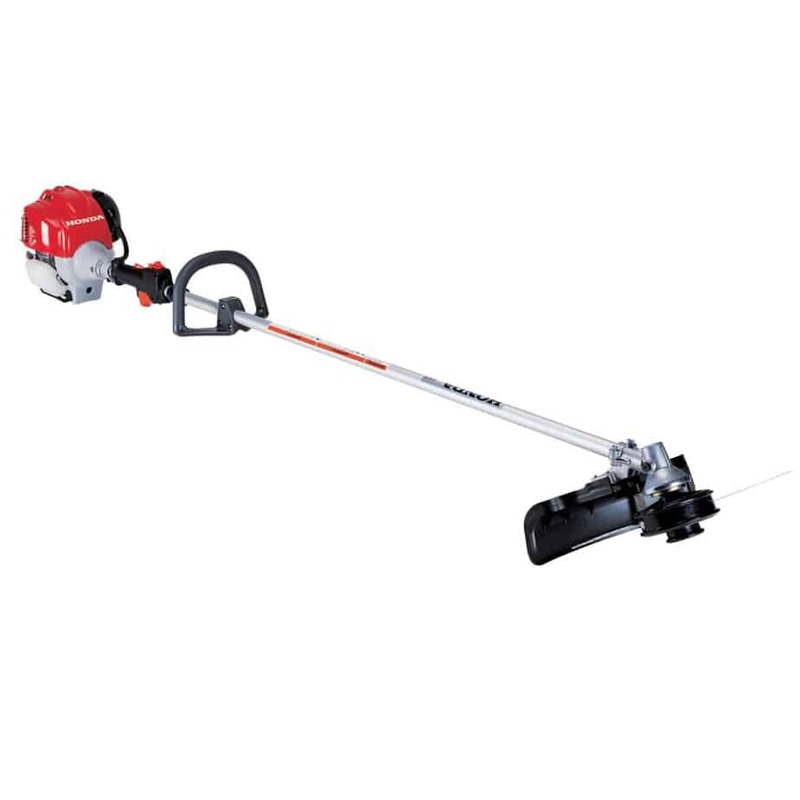 The Honda HHT25SLTAT string trimmer includes a quiet Honda GX25cc 4-stroke engine. Because the engine supplies enough power to be an effective trimmer at only partial throttle, Honda asserts a 50% better fuel efficiency rating over 2-stroke trimmers. Because it is a 4-stroke, there is also no oil smoke, mixing, or burning. Like other Honda engines, the GX25cc was designed to reduce vibration and optimize its center of gravity, thus reducing fatigue and allowing for easy one-handed edging. 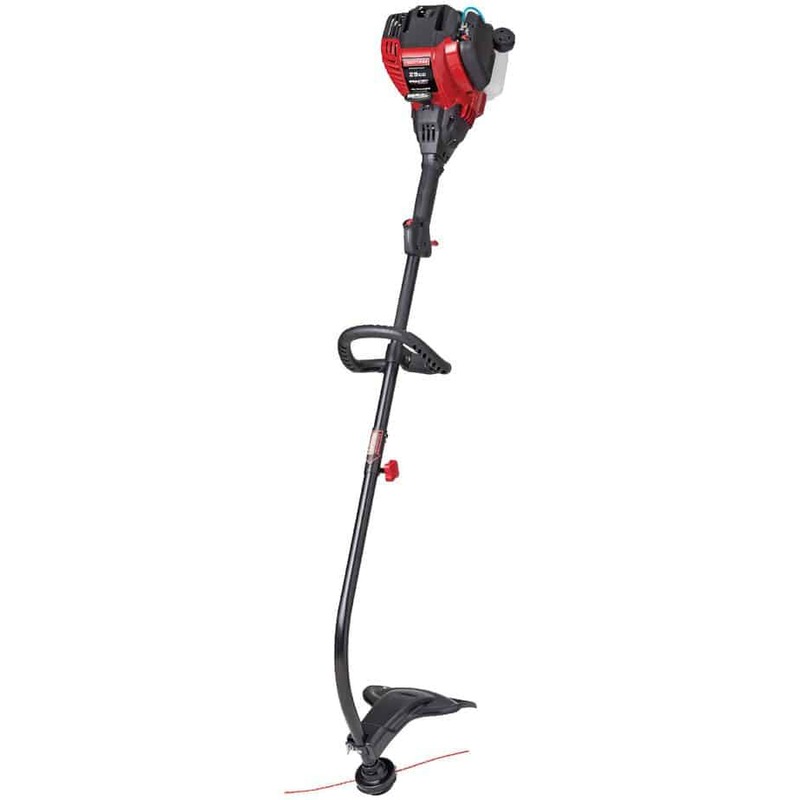 The 45” straight-shaft trimmer also includes ergonomically positioned controls and a vibration dampening loop handle. Several users report frustration with the line head, questioning both its durability and its disassembly method. Each time the trimmer snags, re-threading is required. The spool can be difficult to get into and the bump feed does not perform with consistency–and sometimes not at all. This professional-grade trimmer sells for $330. This includes safety goggles and a harness, which will certainly help support the 13 lb tool. While the Honda HHT25SLTAT is a powerful performer, if you prefer a no-mess line, opt for the cheaper Echo SRM-225. Husqvarna products have been represented on all five of our “Best of 2013” reviews, a testament to the brand’s popularity and effectiveness. The user-favorite 223L gas trimmer maintains an astounding 5-star average by 213 husqvarna.com reviewers. If you feel reviews shown on a manufacturer’s website might be bias, be comforted to know Popular Mechanics has also rated this trimmer as one of their top picks. Husqvarna brands this trimmer as a semi-professional unit, but do not let that title intimidate you. Owners appreciate the 223L’s easy-loading bump head and the powerful Smart Start 24.5cc 2-stroke engine that requires minimal effort to start. Engine vibration rate has been noted as better than some units, but not great. The 223L does garner its share of complaints. While the balanced 9-pound weight of this 59” straight-shaft trimmer makes one-handed edging seem simple and long jobs less tiring, right-handed edging positions the hot exhaust uncomfortably close to your arm. For a unit that costs $250, owners are not thrilled with the cheap guard and other plastic hardware. Several users stressed the importance of wearing safety goggles when using this trimmer in particular due to the small guard size. Users report tackling 5 to 6 foot weeds with ease, but this power comes at a price: fuel efficiency suffers. If your yard is larger or has tricky weeds or edging needs, the 223L is a tough and powerful companion that comes with a 2-year warranty. Hitachi claims its 21.2cc commercial grade 2-stroke engine reduces the amount of pull-force by 50%, and owners love its effortless startup. If environmentally conscious products appeal to you, the engine features PureFire low emission technology that is rated EPA/CARB compliant for 300 hours of use, 6 times higher than the average gas trimmer. This engine is also fuel efficient. This model aims to increase user comfort while powerfully handing tall weeds. It includes an anti-vibration system and a tolerable engine noise. Some users did have trouble with the automatic bump feed functioning properly and had to manually feed out the line instead. The CG22EABSLP requires some assembly on arrival, namely the handle, cutting head, and guard, but all of the required tools are included. Like the Husqvarna 223L, the motor’s positioning can get especially warm against the arm with one-handed maneuvering. Backed by an industry-leading 7-year residential warranty, this 54” curved-shaft trimmer is guaranteed to perform for a low initial investment of $180. While a 7-year guarantee sounds excellent, keep in mind that several owners expressed their frustration with Hitachi’s customer service and warranty fulfillment. With a slew of optional attachments, the powerful 29cc 4-stroke engine means this Craftsman 71170 will not only perform well as a trimmer, but will save you room in the garage by replacing other pieces of equipment. Eight attachable yard tools make this a versatile machine: edger, cultivator, blower, brush-cutter, hedge trimmer, pole saw, 52” curve shaft with bump head, 52” straight shaft with hassle-free head. Extra thick .110 line is durable against obstacles and can cut through small branches with ease. The line is easy to replace. The added convenience of not having to mix oil and gasoline is attractive to busy homeowners and reduces smoke and emissions. Some users claim this machine tends to run on full throttle even after warmed up while others claim it has no problems idling. It is not a particularly lightweight model nor balanced well, so a strap might be needed to reduce fatigue. Note that some reviewers have expressed frustration with poor construction: broken shafts, excessive broken lines, chipped throttle housing, loose screws, and cheap plastic parts have been fingered (the guard does not appear to be too effective in deflecting debris). However, the shaft itself comes with a 10-year limited warranty while the rest of the unit is covered by a 2-year full warranty. 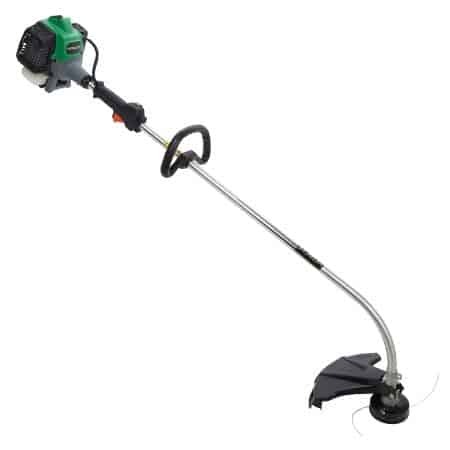 While there are more heavy-duty gas trimmers available, we feature this model due to its affordable price of $150, versatile attachment capability, and aptitude for cleanly cutting thick weeds and damp grass. If you prefer not to spend too much money on a gas string trimmer, you can find the Weed Eater FeatherLite SST25 unit for under $100. Consumers rate this economical unit highly, and Popular Mechanics regards this as a leading budget gas trimmer. Owners claim the 25cc 2-stroke engine is not incredibly easy to start but agree that vibration is minimal. Startup may take several hard pulls, so homeowners with injured wrists/arms/backs should choose another unit. A few owners complained about carb failure that is not covered under the 2-year limited warranty agreement. The SST25 has a less intuitive string replacement mechanism and inconsistent bump, so you may find yourself threading more than you want. As the product name implies, a shorter 52” straight shaft contributes to making this the lightest trimmer we reviewed. Unfortunately, the lightweight advantage is somewhat cancelled out by the difficult engine starter. This trimmer works best on thin grass; tough weeds may tax the included .080 line. 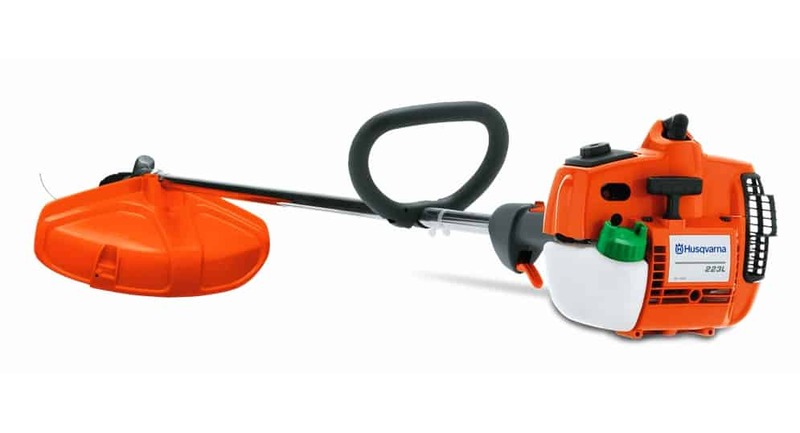 If you perform occasional light yard maintenance and need a go-to trimmer, this affordable unit can fit the bill. While some consumers do experience a lifespan of years, we prefer to think of the SST25 as a temporary, starter, or semi-disposable unit. Did we leave any good string trimmers off the list? Do you like or dislike any of the ones that we picked? Leave a comment with your feedback to help others! I changed mine out today for $3.00, no trouble. Hitachi, owns a company called Tanaka which specializes in high end commercial trimmers and other lawn and garden power equipment. Tanaka, in my opinion has one of the best trimmers around and at very good pricing. Please do a quick review of their trimmers. Useless article . . .
Don’t waste our time telling us you are reviewing a string trimmer and not even bother to include the single most important piece of information . . . the motor/engine life rating. My experience is that of my past 5 gas string trimmers in the “consumer” level (like all of the above reviewed), they have all lasted roughly to their engine life rating. Nearly all gas string trimmers for consumers have an engine life rating of 50 hours!!!!!!! and that’s about as long as they typically last (and don’t let the manufacturers try to convince you a $350-400 gas trimmer is professional grade). If you use it for 1 hour per week and use it once per week, it will last about 1 year. The most I have ever gotten out of a 50 hour rated string trimmer has been 2.5 seasons (in the midwest). I use my string trimmers for roughly 25-30 minutes per week/use for roughly 22-24 weeks per year. Some gas trimmers are rated for 300 hours – those should be pointed out and the ONLY ones eligible to be highly rated. The Echo 225 used to be rated for 300 hours, but now they are putting Chinese motors on them and they are rated for 50 hours, from what I have seen. Any trimmer with an engine life rating of 50 hours should clearly be identified as a disposable tool with a very limited life expectancy.